Pink Dog Digital is excited to announce the re-design and launch of Applied Development’s new website. Like many small businesses, Applied Development wanted their website needed to make a lasting first impression. Co-founders Kimberly Citizen and Biffrey Braxton knew that both prospective clients and employees could see their website first. They wanted their online presence to match the passion they felt about their company and their work culture, and effectively community what they can offer. Kimberly and Biffrey founded Applied Development in 2011 as CEO and COO, after many years in the public and private sector. At large government contractors, Kimberly effectively managed programs valued at over $650M for the Department of Defense. But even with this success, Kimberly often felt like she was just a number at a large contracting firm. They knew that many employees of government contractors felt the same– a worker rather than a valued member of the team. They created Applied Development to change that. 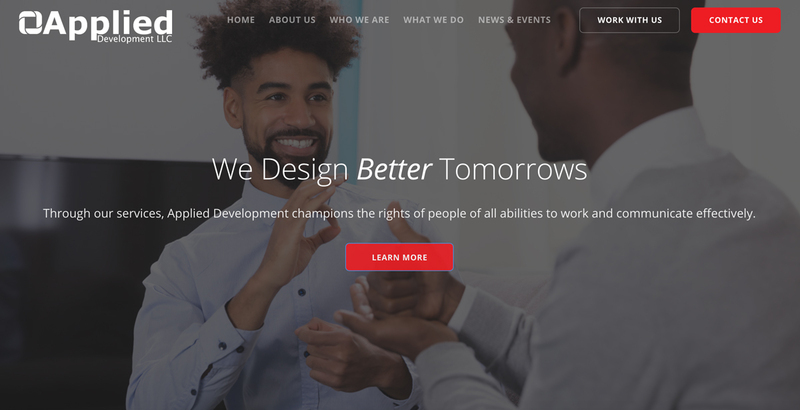 On the new website, Applied Development wanted to emphasize their innovative corporate culture where employees come first. They know that empowering and supporting employees results in success for the clients and the company. Pink Dog Digital’s team has been able to recraft the language to better reflect what Applied Development does, and how the company is innovative and different. The website’s design is more user-friendly, allows Applied Development to showcase their mission: designing better tomorrows. The website now highlights the company’s two service areas, diversability services, and strategic communications. Applied Development ensures that all people can communicate effectively, and now their website communicates their mission more effectively. Under their diversability services umbrella, Applied Development offers sign language interpretation, reader services for the blind, real-time transcription, and ensures that government agencies are in compliance with the Americans with Disabilities Act (ADA). They want to make sure that all employees have the rights to communicate. They currently provide services to clients including the Department of Veterans Affairs, the U.S. Army, the Department of Housing and Urban Development, among others. The website also features the team that makes relationships work between clients and service providers. Applied Development’s dedicated Diversability Program Manager Suzanne Davis works to find the right interpreter for a client. Currently, Applied Development has more than 135 interpreters across 13 states. Through their strategic communications services, Applied Development works with clients to craft clear messaging. Their services include strategic communications, technical writing and editing, developing web content, graphic design and support, social media support, media management, and journalism services. Currently, they work with the Army National Guard (ARNG) Strategic Communications division to provide specialized technical writing and editing. The team at Pink Dog Digital is pleased to see a website that focuses on how and why Applied Development enables everyone to communicate more effectively. We know that this new online presence will help Applied Development grow, providing better tomorrows for a greater number of people.